All transactions are safe and secure with a reliable history in online purchasing behind each of our associates. 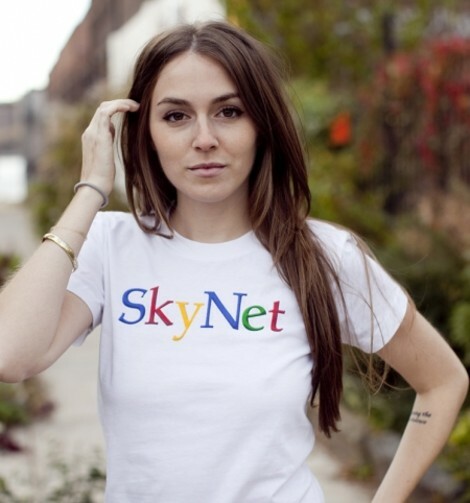 Buy the Google Skynet t-shirt to own Terminator clothing and merchandise. This Google Skynet t-shirt with the search engine's colors is a playful addition to our Terminator clothing collection, and it can still make the Terminator soundtrack play in your mind. If you can't hear the music well in your head and don't already have a copy of your own, then get it today before the cyborgs come for you. Listen to it as you play with other products like the Terminator action figures and toys featured in our gallery. If you're more of a fan of the notable lines in the movie than the music, take a gander at the Arnold Schwarzenegger tees below like the I'll Be Back t-shirt and Hasta La Vista Baby. In addition to the Google Skynet tee above, browse the Terminator Clothing Gallery for more apparel like men's and women's clothes, kids shirts or hoodies.